ISIL still controls fields capable of producing 20,000 barrels of oil a day, along with some small refineries that can process it into fuel, the IAEA says. 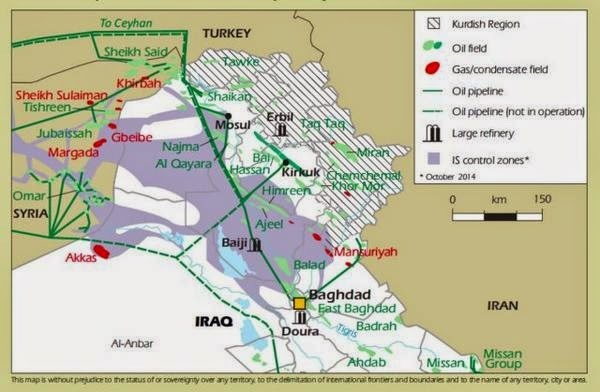 With the falling oil prices, ISIL is also probably selling its oil in the black market at lower rate than last month. If its oil goes for around $20/barrel, their current income could be around $500,000 a day, much less than the estimates of $1-2 million a day over the summer. Still to be hit are ISIL-controlled oil fields at Najma and Qayara (south of Mosul on the map), Himreen (south of Kirkuk) and Balad (north of Baghdad). Together they continue to produce about 10,000 barrels a day.